Carbon nanotubes are extremely tiny sheets of carbon rolled into cylinders with diameters 10,000 times smaller than a human hair. Despite their small size, they are 10 times stronger than steel, yet are a fraction of the weight. The unique chemical and physical properties of carbon nanotubes—including their strength, flexibility, and ability to conduct heat and electricity—fascinate researchers. 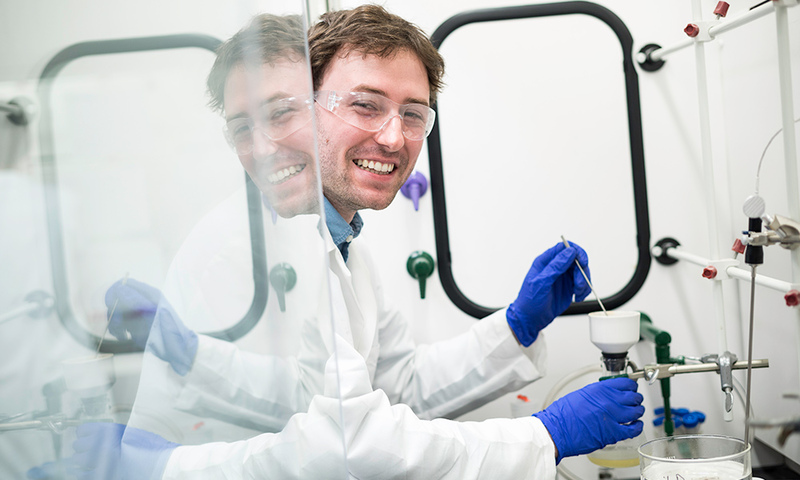 This summer, under a grant from the US Department of Energy, Bailey is working with Rochester chemistry professor Todd Krauss to develop a special polymer to attach other molecules to nanotubes. Their work could have significant applications for creating renewable energy sources. One of the challenges in working with carbon nanotubes is trying to attach other molecules to them—for instance, through chemical bonds—to take advantage of the nanotubes’ unique properties. When researchers try to chemically bond molecules to nanotubes, the bonds within the nanotubes break. This creates a defect in the tube itself and consequently diminishes the tube’s conducting properties. The polymer Bailey is helping to develop will allow scientists to attached molecules to the tube without breaking nanotube chemical bonds. Krauss likens chemical bonds to Velcro: one side is the sticky side and one is the fuzzy side, and pulling them apart requires a lot of energy. The polymers would be more akin to Colorform stickers that cling to glass—they pull off easily and leave no glue or stickiness. “This polymer that Austin is modifying will allow us to stick things on the nanotubes very gently compared to a direct chemical bond,” Krauss says. The ultimate goal is to use the polymer to attach light-harvesting materials to the nanotubes. These materials would grab photons of light and then transfer the light’s energy to the nanotube. Another possibility is attaching materials to the nanotubes that take the protons in water and turn them into hydrogen, a clean-burning fuel. In both cases, the polymers would help create renewable energy solutions. 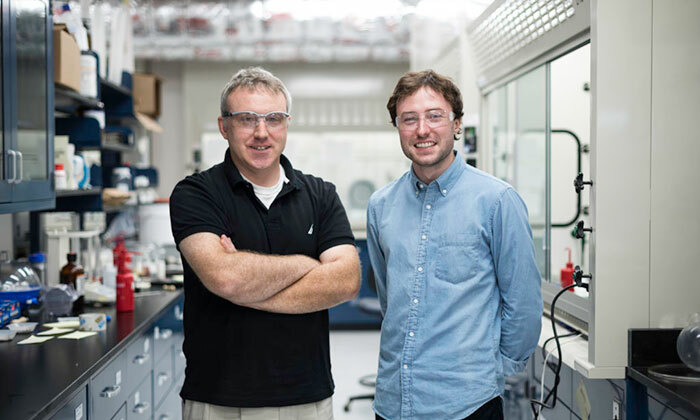 Take Five student Austin Bailey (right) is pictured in the lab of chemistry professor Todd D. Krauss (left).